Mek Wi Kuk/Let’s Cook with Belize Food Tours! Two years ago, brother and sister duo Dora and Felipe Paz started a unique venture that quickly became a must-do activity on Ambergris Caye. 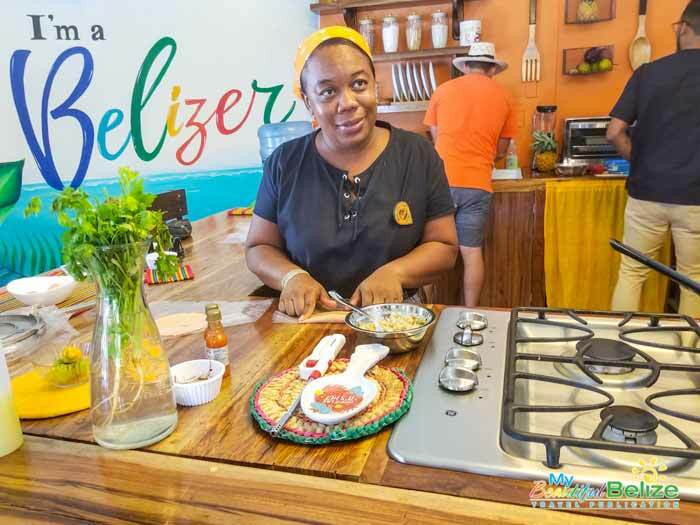 Belize Food Tours took the best of Belize: food and vibrant Belizean personalities, and converted it into a fun tour that takes guests on a culinary adventure. Now they’ve taken a step further, adding a cooking segment to their repertoire, inviting guests to try their hand at recreating some tasty Belizean favorites. “Yuh Belizean Kitchen” is located on Barrier Reef Drive, directly across from Fido’s Courtyard and in the same space as Maxi’s. The cheerfully decorated space has ample seating to take full advantage of cooking demonstrations, and for the inaugural first class, we were thrilled to make a delicious sweet potato pudding (pound), ceviche and the tres amigos de maiz (three friends of corn): panades, garnaches, and salbutes. The class has been a long time coming, and it’s in the capable hands of the folks at Belize Food Tours, who have established themselves as a fun and energetic creative force. Farah is of Garifuna descent, and she takes pride in sharing tidbits about her culture and history as she prepares various items for cooking. Book your Belizean Kitchen lessons today by visiting their website at www.belizefoodtours.com. They have lots of fun events planned around the kitchen, including guest chefs and specialty ingredients. Indulge in a culinary adventure that you can recreate back home when you’re missing Belize! 1 registered members (1 invisible), 213 guests, and 18 spiders.